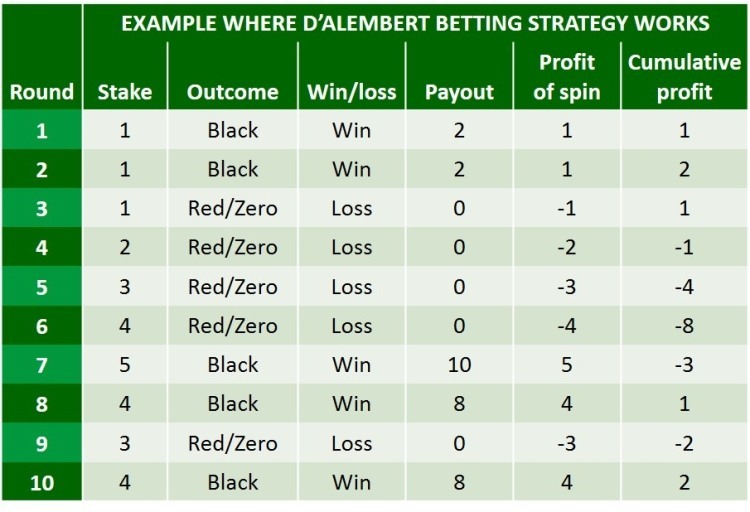 The D’Alembert strategy is designed for betting on ‘even’ bets on games such as roulette, blackjack and baccarat. The strategy relies on the logic that the number of wins and losses eventually even out. If you, for example, look at the game of roulette, at the end of a long session, there must be roughly the same amount of spins on Black as Red numbers. To start using the D’Alembert strategy, the first step is to determine the size of your stake unit (for example $1), a bet size that can be any amount you prefer. You start betting with one ‘unit’, and every time you lose a bet, you increase your next bet with one ‘unit’. If you win, you decrease your next bet with one ‘unit’. The advantage of this approach is that it is very straightforward to implement. It works great if you aim for an equal amount of losses and wins as long as you do not have more than 5 losses in a row. Example 1: Here you see when the D’Alembert strategy works well. In this example we have applied the D’Alembert strategy as a roulette strategy. You always bet on Black and start with one unit (which could be $1). Even when the number of wins and losses are equal, you end with a profit. The D’Alembert strategy works well if the number of wins and losses are pretty balanced. Example 2: Here you see when the D’Alembert strategy gives negative results. You always play black. You start with one unit (which could be $1). If you have a few more losses than wins, and it stays that way, your stakes end up to be relatively large at the end of the session. In particular, if you lose the last 2 or 3 spins (with the higher stakes), you end up negative. The weakness of the D’Alembert strategy is that the stakes become substantial at some stage (after the number of losses are greater than the number of wins). One way to mitigate the downside risk is to apply limits. For example, you determine beforehand that your stake cannot exceed 5 units. This way, you get to control the level of the stakes.